NASA’s Dawn spacecraft has been taking images of Ceres, the largest body in the asteroid belt, since December 2014. As Dawn’s orbit brought it closer to the dwarf planet’s surface, a mystery appeared: Ceres has bright spots. Over 130 separate areas on Ceres, reaching up to 6 miles wide, shine out from their dark surroundings. After months of study and speculation, scientists have confirmed that the brightest spots are made of sodium carbonate, making Ceres’ Occator Crater the largest deposit of this sort of mineral ever found beyond Earth. Since images of the bright spots were released, scientists and the public alike have speculated about what they could be: NASA even created a poll to gather opinions. At first, the leading theory suggested that the bright spots were expanses of water ice, either brought to the surface by volcanic activity or revealed by an impact. Even as evidence mounted that the spots were made of some sort of mineral salt, more and more ideas, ranging from the plausible theory that Ceres was covered in an ice mantle just below the surface to the fanciful notion that the spots could be a shining alien city. Until June, no clear answer revealed itself. According to Andreas Nathues of the Max Planck Institute in Germany, “The main problem we had [analyzing the bright spots] during approach phase was that our spatial resolution was too low.” Because Dawn’s instruments were calibrated based on Ceres’ darker surface, the images didn’t capture any detail in the bright areas. “In June, we divided our exposure times for the bright spots and the dark surface. Then the spatial resolution started to become sufficient to identify what the spots are,” Nathues said. As Dawn and its newly-calibrated cameras approached Ceres, details of the bright spots came into focus. “Dawn has transformed what was so recently a few bright dots into a complex and beautiful, gleaming landscape,” said Marc Rayman, Dawn’s chief engineer and mission director. Now, two new studies, published in Nature and Nature Geoscience, have concluded that Ceres’ bright spots are sodium carbonate and that Ceres is much drier than previous observations led scientists to expect. 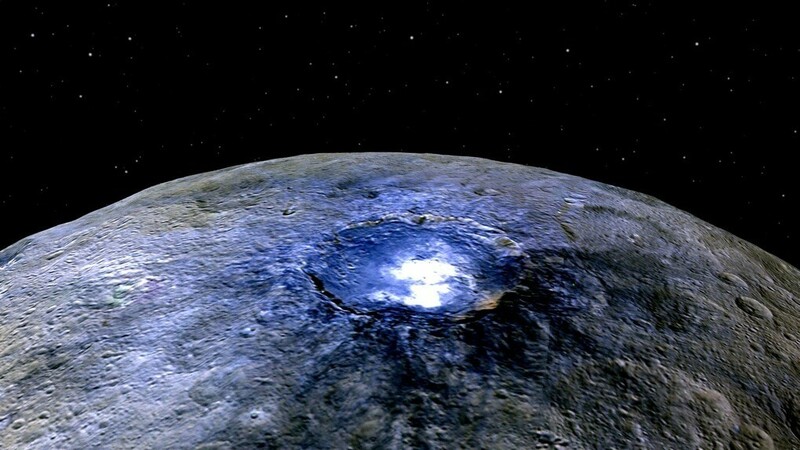 However, the study found no evidence for water in any of Ceres’ craters: if there was a subsurface ocean (or subsurface puddles) there, it either froze or disappeared millions of years ago. Ceres even has less ice than expected, according to the study in Nature Geoscience, led by Michael Bland of the US Geological Survey. 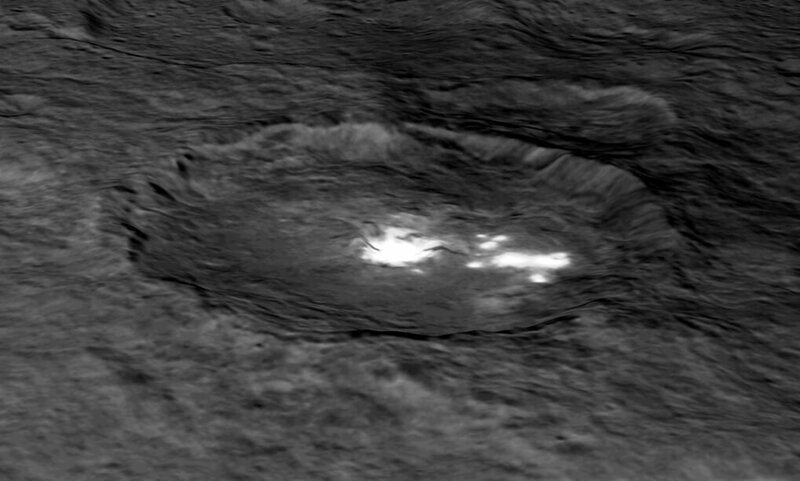 “Before Dawn’s arrival there was this expectation that Ceres would be relatively ice-rich,” Bland said, but when the spacecraft got there it found topographical features indicating that Ceres’ subsurface isunder 40 percent water ice by volume. That could be enough water to aid in the formation of carbonates, but it would have to be liquid and Ceres has a temperature of -105 degrees Celsius. As Nathaus expressed, “it’s very hard to explain carbonates in these amounts. This is still a mystery.” The results published in these two studies “are two pieces of the puzzle, and . . . there’s still work to be done to link them together,” Bland said. The Dawn spacecraft will continue to collect puzzle pieces for the remainder of its mission, as NASA recently decided that it will remain at Ceres rather than moving on to other objects in the asteroid belt. 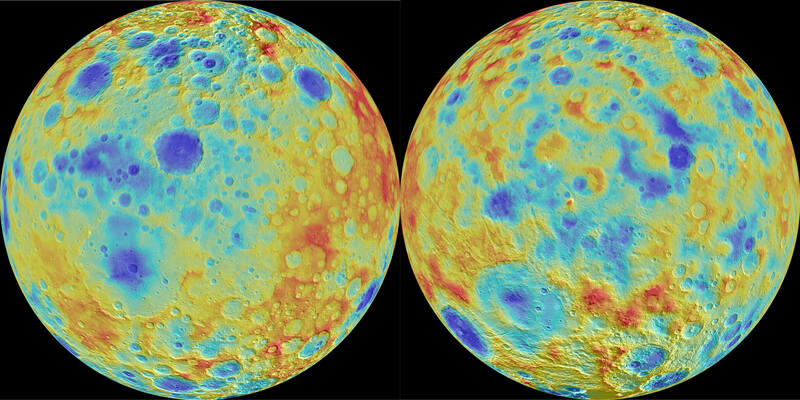 “It’s amazing how much we have been able to learn about Ceres’ interior from Dawn’s observations of chemical and geophysical properties. We expect more such discoveries as we mine this treasure trove of data,” said Carol Raymond, deputy principal investigator for the Dawn mission. The data will keep pouring in; it’s up to scientists to piece it together.